With nearly 2 million members and more than $100 billion of life insurance in force, the Knights of Columbus is the largest Catholic fraternal organization in the world and one of North America’s largest life insurers. As an organization, the Knights of Columbus helps support a multitude of charitable causes, contributing $1.55 billion and 691 million volunteer hours to charitable projects over the past decade. With the Knights of Columbus, you can make a difference for your community, your Church, and your family. The insurance program has earned numerous accolades including the highest possible rating for financial strength (currently: A++, Superior) from rating agency A.M. Best for 41 consecutive years, and designation as a “World’s Most Ethical Company” by the Ethisphere Institute in 2014, 2015, 2016 and 2017. The Knights of Columbus is one of only two companies in the life insurance category honored this year. for a custom-tailored needs analysis, so that you will know exactly where you stand. Ralph is a brother knight and an experienced, knowledgeable KofC field agent. Retirement income you can count on. Guaranteed. What is it? An annuity is a retirement savings product. You make contributions, and, after a specified amount of time, the annuity pays you a regular income stream. Who needs it? There are few financial matters we give more thought and attention to than our retirement. Everyone thinks about it. Everyone needs it. Retirement annuities help you ensure that you have enough money to live on in retirement. But retirement income can be a difficult thing to calculate, especially with a changing landscape of federal and employee-provided benefits. With a properly structured retirement annuity from the Knights of Columbus, you can have retirement income that you cannot outlive, guaranteed. Retirement annuities provide security and peace of mind that people of all ages and financial circumstances can benefit from. How does it work? Knights of Columbus retirement annuities come with many different payment and plan types (see below) which determine the nature of the annuity. Once established, the money within a Knights of Columbus annuity continues to earn value, before eventually disbursing according to the options that you elect. Knights of Columbus annuities also come with two important guarantees. First, with a Knights of Columbus annuity, your principal is guaranteed. Regardless of market condition or company results, your Knights of Columbus annuity will not lose value. Second, each Knights of Columbus annuity comes with a guaranteed minimum interest rate. No matter the market fluctuations, your annuity is guaranteed to never earn less than the contractually stated amount on an annual basis. if you would like to make additional contributions to your existing annuity or if you would like to get on the path to financial security by starting an annuity or a Paid-up at Age 65 plan with the Knights of Columbus. Ralph is a brother knight and an experienced, knowledgeable KofC field agent. Protect your assets. Get quality care. Prepare for the future. 70 percent of people over age 65 will need some type of long-term care services during their lifetime. 3 years is the average duration of long-term care needed per individual. $91,250 is the average annual cost of private nursing home care. $80,300 is the average annual cost of at-home nursing care. Traditional medical insurance programs and government medical insurance programs don’t usually provide enough help. According to the Department of Health and Human Services, Medicare only pays for long-term care services for a maximum of 100 days, with a copay after the 20th day, and only if you meet certain criteria. Medicaid does pay for long-term care, but only if your income is below a certain level, and you meet state requirements. Knights of Columbus Long-Term Care insurance policies establish a pool of money (also known as a maximum lifetime benefit), which is determined by a number of options that you choose from (see below). That pool of money is then available for you to use to cover qualified long-term care expenses. When the pool of money is exhausted, your long-term care policy ends. 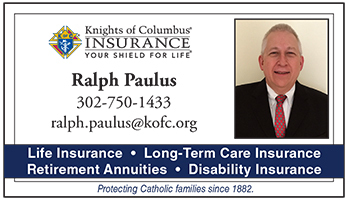 The Knights of Columbus also offers a spousal discount program, through which spouses who apply for long-term care insurance coverage together are eligible for up to a 30 percent discount. Comprehensive Coverage – Comprehensive long-term care insurance allows you to use the policy to help cover expenses at home or in a skilled nursing facility. Facility-Only Coverage – Facility-only long-term care insurance helps cover expenses in a skilled nursing or assisted living facility. 3-Year – Establish a maximum lifetime benefit designed to help cover three years of long-term care expenses. 5-Year – Establish a maximum lifetime benefit designed to help cover five years of long-term care expenses. 10-Year – Establish a maximum lifetime benefit designed to help cover 10 years of long-term care expenses. Working with your Knights of Columbus field agent, you establish the daily benefit amount that the policy provides, based on your budget and your projected need. Your daily benefit amount, combined with your benefit period, will determine your maximum lifetime benefit, all of which will affect your premium. Long-term care insurance policies come with an elimination period, which serves as your deductible or out-of-pocket amount. You can select a 30, 90, or 180-day one-time, lifetime elimination period, after which time your benefits will begin to be paid. 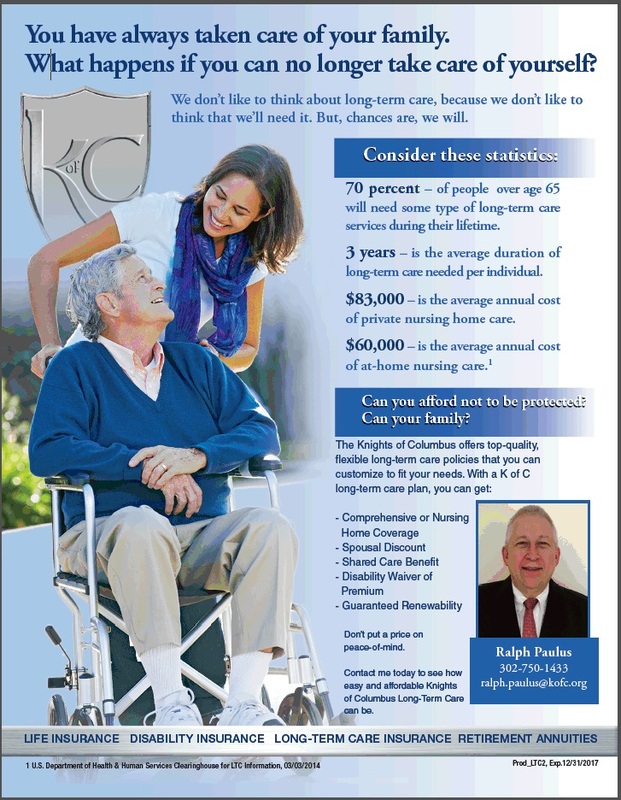 A number of special features and benefits – often called riders – are available on Knights of Columbus long-term care insurance products. An example is the compound inflation rider, which will increase your maximum lifetime benefit annually. Life Insurance As a Gift? The initial reaction for many people when you mention life insurance as a gift is a quick step back and a questioning stare. “How morbid,” they think. While it may seem that way when you first mention it, life insurance is really a thoughtful gift that can be a financial life preserver in tough times. The problem with life insurance is the general perception. Many think of death instead of the great benefits it provides, and the security that it offers – even while you’re alive. Life insurance should be thought of as a precautionary protective measure for a family unit. The purchase of this product can mean saving your home, sending your children to college, and preserving your spouse’s quality of life in the event of your death. One of the times you may want to purchase life insurance for someone is when a family has a new baby. It’s a great, low-cost way to set money aside for the future (i.e. college tuition, housing, business start-up, etc.). Of greater importance, it ensures these children will have insurance as adults, in case an illness later in life makes him or her uninsurable. Newlyweds are also ideal recipients for life insurance. As they join their lives and financial responsibilities, young couples need to make sure that their early investments are fully protected. If something were to happen to one of them, the other may be faced with serious financial hardship. A life insurance policy is an ideal way to ensure their future and protect their assets. As nontraditional as it may be, life insurance is a wise and caring gift to purchase for many people.